International Social Work Exchange Program is a 3-credit course as a structured independent study. It is counted as an elective toward graduation requirements. There are two course requirements: (a) creating a newsletter for Kent School about the trip and (b) developing a video/CD of the trip. Both are group exercises. You will be required to attend all meetings and activities both prior to and while overseas. Cost ranges between $1900 and $2200 depending on location and airfare at time of booking. Cost includes major transportation (flight, trains and visits to cultural sites and agencies) lodging and breakfast. Depending on country visited other meals MAY be included. Cost is determined by the country visited, cost of air fare and lodging etc. We work very hard to make this as inexpensive as possible. Student loans may be obtained for this credit course. The Spring 2018 program in Germany. 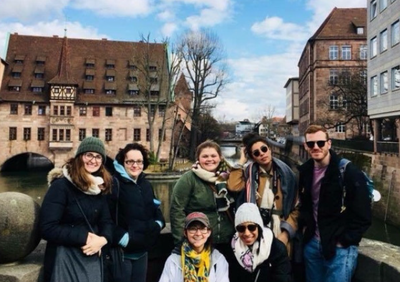 View the student produced 2018 Germany newsletter. The Spring 2016 program in Germany. Click here to view the student produced newsletter from Spring 2016.